Chef Roberto Trevino’s highly anticipated restaurant, El Buda Latin Asian Restaurant, opened on Thursday, December 7th. The chef driven concept is located in the heart of Downtown Orlando at 116 West Church St. (between Hamburger Mary’s and the train tracks) and will introduce this city to his style of fusion that marries Latin and Asian cuisines in a truly unique way. Trevino, a native of California, moved to Puerto Rico in the early 1990s where he solidified his culinary reputation as a star chef with some of the island’s most popular restaurants including Dragonfly, Aguaviva and Budatai. Trevino has cooked dinner at the James Beard Foundation house in New York for their award events, and is frequently featured as a guest chef in food events throughout the US and the Caribbean. He has made numerous television appearances both in Puerto Rico and the US, including a battle against renowned Chef Mario Batali on Iron Chef America, as a contestant on The Next Iron Chef, with Rachael Ray on her show $40 a Day, as well as on his own local shows Kandela and 4 Minutos con Chef Treviño. He’s currently a recurring guest judge on Food Network’s Beat Bobby Flay. Signature dishes present themselves throughout El Buda’s menu that include a variety of sections for guests to explore including Dim Sum and Platitos (Pork and Sweet Plantain Dumpling and Octopus Pimenton Kaisou), Rice and Noodles (Ho Fun with Grilled Churrasco and Ropa Vieja BiBimBap), Poke, Crudo and Greens (Herame con Coco and Smoked Salmon Pineapple Poke) and Deluxe Meat and Fish (Duck Breast with Miso Honey Potatoes and Beef Short Rib with Yuzu Papas Bravas). A diverse selection of sides range from Teriyaki Tots (Trevino loves tater tots) to Chicharron Popovers. The bar program will place an emphasis on craft cocktails and beer, with an emphasis on local brews and will also serve wine. Located on Church street, the restaurant is dotted with original artwork and unique artifacts. The historic building dates back to the 1880s, and Trevino has kept much of it intact to reflect its historic roots with lots of exposed brick, wood and an open kitchen. A spire from the original Arturo Fuente cigar factory from West Tampa (circa early 1900s) serves as the center focal point of the dining room, bringing a touch of Latin history to the space. A serene outdoor patio filled with fresh herbs and comfortable seating will also feature live entertainment once Trevino and his team launch their weekend brunch. One of the restaurants most interesting components can’t be seen unless the guests go exploring. At the bottom of the steps where the spire holds court is The Cellar, a prohibition style cocktail lounge that will serve a variety of El Buda’s signature cocktails and is the perfect place to begin, or end, an evening. El Buda is located at 116 W. Church Street (look for the side entrance adjacent to the SunRail tracks) and is open daily for lunch and dinner starting at 11:30am. Danketsu is the all new Asian Fusion restaurant on Orlando’s east side. Although there is a big focus on Korean BBQ, the menu has plenty to offer in terms of sushi, noodles, hot pot and other popular Asian dishes. Fusion cuisine or fusion food, is a general term for the combination of various forms of cookery and is offered in several forms. Danketsu may not cross mix dishes with one another, but they are certainly a regional fusion restaurant. Regional fusion combines different cuisines of a region into a single dining experience like combining the various cuisines of different Asian countries. So the name Danketsu derived from Japanese, that is pronounced (don-ket-su) which means combination, union, and unity…. is a very fitting one. The location on Lake Underhill was formerly a Hooters Wings, that has been closed for a few years now. The outside received a new paint job and got new signage, but the inside has been beautifully redone. The bar has a pretty cool mural painted on the wall with vibrant colors. Of course there are the obligatory super large TV screens with a large projector screen at the front of the restaurant. The main dining room is very open and spacious with plenty of regular tables and seating at the bar. If you know ahead of time that you want Korean BBQ or Hot Pot, let the host station know and they will seat you in the section that has booths with tables that have built in burners and a table grill. Even if you decide after sitting at a regular table, they will gladly move you. We started out with the Tuna Tataki that featured thinly sliced seared tuna served with ponzu sauce. The tuna was really good and delicately sliced with a very light sear. Just to sample the quality of the sushi rolls at Danketsu, we ordered the Combo Set D. They have a decent selection of sushi, nigiri and sashimi on the menu with some pre selected roll options in the combo sets. The combo set D features a California roll, spicy tuna roll and a spicy salmon roll. The rice was nice and sticky and did not fall apart after dipping in soy, and the fish was fresh with a nice kick to it. The Yakisoba noodles were the only disappointment of our evening. The noodles themselves were cooked well and had great consistency, but really lacked any flavor or toppings. For $13.00 I expected more chicken and vegetables. The Miso Ramen was a very large portion and tasted exceptional. I would advise Danketsu to put more descriptions in the menu. Quite a few items lack any information that tells the guest exactly what they are getting. The miso ramen is simply listed as noodles in miso base, and that sounds rather plain especially when you look at the picture of the dish we got. Our server was also unsure of what the ramen came with. Overall, we really liked Danketsu and since we live on the east side, we will certainly return. The prices are very reasonable and the portions are large. With two sake bombs, two beers and all of the food pictured above, our bill was $68.00... we had plenty left over for lunch the next day too. The restaurant is fairly new, so I will give them some more time for adjustments and training servers to know the menu better. On our next visit we are doing the Korean BBQ and a Hot Pot...so stay tuned for that. Danketsu is open from 4:00 pm to 2:00 am Monday to Sunday, and features nightly drink specials like $5.00 sake bombs on Friday and various specials for sporting events. If you have been keeping up with all things Disney, more specifically the rebranded Disney Springs, you have heard about the complete redesign and all of the new restaurants that are open, with more scheduled to open soon. Morimoto Asia is one of those new restaurants that is located at The Landing at Disney Springs, which is an entertainment and dining retail district. With an overhaul and rebranding of this portion of the resort, Disney Springs is aiming to present a fresh and new face to the Magic Kingdom that is sure to be an extraordinary experience. Morimoto Asia is the first collaboration with Patina Restaurant Group and Chef Masaharu Morimoto and the Japanese master chef’s first pan-Asian restaurant. Morimoto Asia offers an entirely new experience for guests, led by the creativity of Chef Morimoto, already one of the most inventive forces in Asian cuisine. The Patina Restaurant Group was built on the belief that culinary excellence is an art form, and that a superb visit to a cultural venue should be matched with equally inspired cuisine. This is a dynamic collaboration that has resulted in a restaurant that looks wonderful and delivers on the promise of culinary excellence. Morimoto Asia is full of eye catching chandeliers, glass light sculptures and unique exhibition kitchens that showcase traditions like Peking duck carving and dim sum. Inside the 36-foot tall, two story layout of Morimoto you will find lounges, private dining spaces, and an exhibition glass encased kitchen that allows guests a behind the scenes glimpse of the culinary action. The second level sushi bar and lounge have a separate entrance. 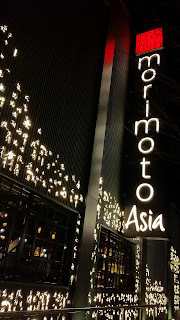 The menu at Morimoto is described as Pan-Asian and was inspired and created by Chef Masaharu Morimoto, a Japanese chef, best known as an Iron Chef on the Japanese TV cooking show Iron Chef and its spinoff Iron Chef America. He is also known for his unique style of presenting food. Pan Asian food combines a little bit of everything from various Asian cultures, so at Morimoto Asia, you can find spectacular Chinese style spare ribs, Korean BBQ Kalbi short ribs, Vietnamese style Pho, Pad Thai cooked in the traditional Thai style, and of course lots of Japanese food with a large variety of sushi and sashimi. Although Chef Morimoto has a wonderful selection of Sake and various other craft cocktails, beer goes with just about everything. As part of a special beer dinner pairing I was invited to, we were treated to a pairing from one of my favorite new brewers, Crooked Can Brewing Co. Crooked Can Brewery is an upstart craft brewery based in Winter Garden that is creating a cultural following with unique craft brews and excellent taste. Our first course was the Spring Collection of Shellfish Ceviche that featured Alaskan king crab, Washington state mirugai (saltwater clam), Maine Uni (sea urchin), Salmon roe, and bean thread noodles. This was a very unique dish with all kinds of textures from the various ingredients that all worked really well together for a great starter. The beer paired with the first course was Crooked Can’s seasonal Cherry Blossom Kolsch that will only be made for Morimoto Asia, and for a limited time. Very crisp and mild with excellent flavors and drinkability. The second course was a Duo of Duck with Morimoto Peking Duck wrapped in flour pancakes, hoisin miso, apricot chili and scallions. The duck was accompanied with a consomme soup of daikon, carrots and foie gras. The duck was nice and crispy inside and full of flavor and the soup was a wonderful addition. The second course was paired with Crooked Can’s Bock Humbug, which is a Dopplebock, or double bock which makes it a darker and maltier beer but slightly sweet with an ABV of 6.9%. For our third course, we had a Trio of Chicken Satays with chicken skins, boneless chicken wings and chicken thigh with yuzo-kosho (a fermented chili and yuzu peel seasoning), Himalayan salt, spicy garlic glaze,peanut sauce and cilantro. All of the chicken was delicious and paired perfectly with Crooked Can’s Mc Swagger Amber Ale. Our fourth course was Domestic Wagyu Sirloin “Ishiyaki” that is grilled tableside in a ceramic fire pot with a hefty cooking stone. This dish was served with kimchi fried rice cake, fresh wasabi and a smoked soy for dipping. Wagyu of any type is usually pretty good, and the one at Morimoto did not disappoint, and it was a fun experience to cook it yourself. This was paired with Crooked Can’s Stout beer that was very dark and full bodied. Our fifth course, or the dessert course was Taiyaki, which is a Japanese style fish shaped pancake stuffed with sweet azuki beans. This was served with a matcha green tea gelato. I did bite the fish’s head off before I took a picture, but I couldn't resist trying the fun to eat dessert. Paired together with the gelato, this was a great ending to our food journey for the evening. The dessert was paired with perhaps my favorite Crooked Can beer of all time… Cloudchaser. Crooked Can produces this wheat beer in the true Hefeweizen fashion that leaves it unfiltered and cloudy. The beer has unique flavors of banana and cloves with an often dry and tart edge, some spiciness, bubblegum and notes of apples with little hop bitterness, and a moderate level of alcohol. Although I had these on a separate visit to Morimoto Asia, It's worth noting the Morimoto Spare Ribs with cilantro and hoisin sweet chili glaze are probably some of the best you will find in Orlando. I don't say that lightly either..they are addictive and darn good. 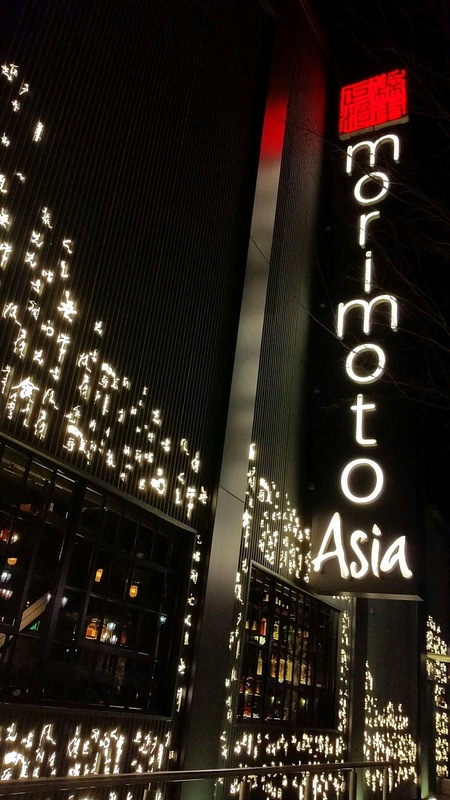 Disney Springs is still being built up and undergoing a lot of change, but there are quite a few restaurants open already, and it's worth a trip to go visit… especially Morimoto Asia. The restaurant is beautiful inside and out with a two story dining space and they even have an upstairs outside section with a fun tabletop shuffleboard. The menu is fun and inviting and even the pickiest of eaters should be able to find something to eat. I have always been a fan of Bento Cafe, especially the Downtown Orlando location. Bento primarily serves up what is best described as Pan-Asian cuisine, with a wide array of different foods from all over Asia. 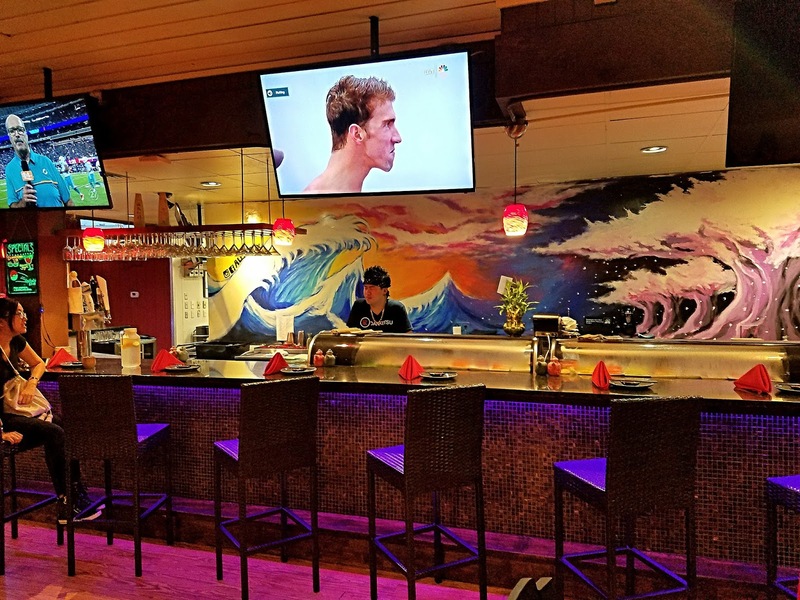 The downtown location is great if you happen to work or live near there, as it has become a staple in that area for quick and fresh Asian cuisine at a reasonable price. I however live on the east side of Orlando, and unless I ask my wife to bring me something home, it’s a bit out of the way. That is why I am very happy to share with you my most recent review of the all new Bento Cafe UCF. Yes you heard right...Bento has a brand new location in the Plaza at University, and the food is just as awesome as it is at any other location. The Bento Cafe brand, If you are not familiar with them, is a small chain of seven restaurants with more on the way, that offers a creative mixture of Asian inspired dishes from wok stir-fry to fire-grilled items to sushi using the finest Asian spices and the freshest ingredients all at great prices. The concept at Bento is to bring unique and authentic Asian food in a fast and efficient manner. Everything on the menu is cooked to order and prepared in minutes and served up in an atmosphere that is fun, friendly and stylish. The word “Bento” means boxed-meal in Japanese, and they have a wide selection of traditional boxed meals, but the menu includes a wide variety of sushi rolls, sashimi, nigiri and chirashi bowls as well as soups, udon noodles, rice bowls and noodle bowls. They also offer Boba Tea, a popular Asian beverage that is consisted of milk tea and chewy tapioca pearls. Every store is designed differently which makes visiting each Bento Cafe an experience. Each store will be either dominated by the warm red dragon colors or the cool blue dragon colors. Each Bento has a sushi station, but the UCF location has seats at the sushi bar, so you can watch the chefs prepare your rolls live and in person. Speaking of sushi, the Jade roll with marinated spicy tuna, eel, avocado, krab delite, masago, scallions and eel sauce tasted just as good as it looked. For my entree, I chose the the Sesame Wok Stir Fry bowl. This dish comes with your choice of chicken, beef, shrimp or tofu and red bell peppers, snow peas, onions, baby corn in a sesame soy sauce. I really enjoyed the flavors, and the portion was more than I could eat. Now, I really did enjoy my entree selection, but it would be dishonest of me not to tell you that I was really jealous of my wife’s Bento Box. She opted for the Sriracha Garlic Chicken in a bento box. You can get chicken, shrimp or tofu grilled or fried with red bell peppers and onions with a sweet and spicy Sriracha sauce for dipping. Bento boxes come with your choice of steamed rice or lo mein, ginger salad, and string beans and a dessert. Not only was this delicious and lots of food, it only costs $8.95, and that's a bargain. The UCF Bento Cafe is the third one to open in the Orlando area, and I can now say I have been to all three, and all three locations have been very consistent in quality and service. Sometimes chains can vary in quality and the overall experience you may have there, and I am impressed with the consistency of Bento Cafe. 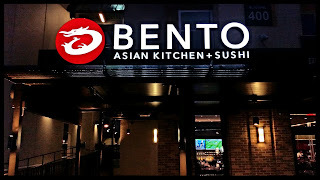 If you are looking for some really good Asian food with variety and great flavors in a fast casual environment, check out Bento if you have not done so already. Whats even better is the fact that you can dine there without putting a hurt on your wallet and without sacrificing quality over price.